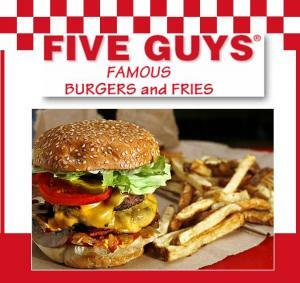 2011 has been a very good year for Five Guys Burgers and Fries, as it again tops consumers’ favorite quick-service restaurant (QSR) list, according to the annual consumer restaurant chain survey conducted by Market Force Information. It's followed by long-time West Coast favorite In-N-Out Burger (#2) and Chick-fil-A (#3). The study also revealed that each of the top three restaurants excelled in friendly service, the category with the most differentiation among all contenders. More than 4,500 consumers across North America participated in the survey conducted in August 2011. It examined which QSRs consumers prefer and which attributes are most important to them. Market Force first calculated the favorites based on pure number of votes, and then factored in the number of locations for each chain for a more level view of the results (see chart below). The bottom three QSRs on the list are McDonald's, Subway, and, in last place, Burger King. The study also asked respondents to rate QSRs by attributes such as food quality, taste, speed of service, cleanliness and value. 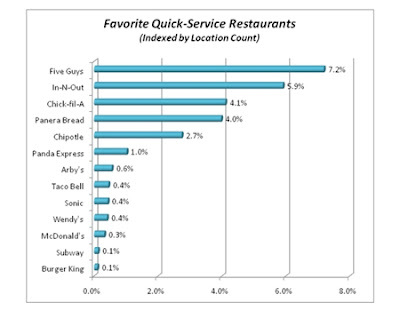 Friendly service was the category with the most differentiation, and it was dominated by Chick-fil-A, In-N-Out Burger and Five Guys. The least variation was found in the taste category, which suggests that consumers see the most differentiation—and value—in those restaurants with the best service and friendliness. While consumer-favorite Five Guys didn’t dominate any of the categories, it performed consistently well across most of them. Similarly, In-N-Out Burgers scored highest in food quality and second highest in friendly service and value. Other chains were less consistent. For example, McDonald’s scored poorest for quality of food, but ranked second for speed of service behind Sonic. Similarly, Taco Bell was lowest in cleanliness, but highest in overall value.